In my study, inspecting hand-made, hand-gilded clock finials. 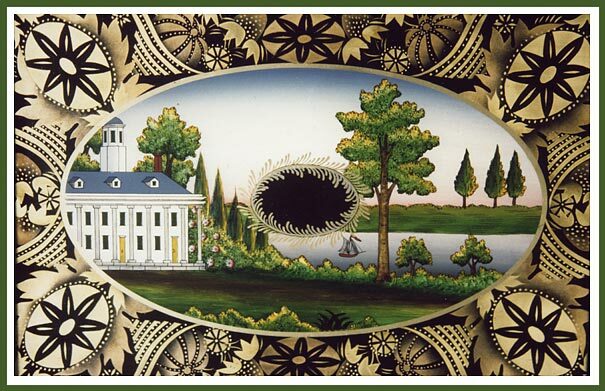 Below and right: reverse painting on glass.  See my recent design, a Dragon Motif Lyre Clock.  My participation in the Designer Craftsmen Show of Philadelphia in January, 2006 was probably my last such appearannce. 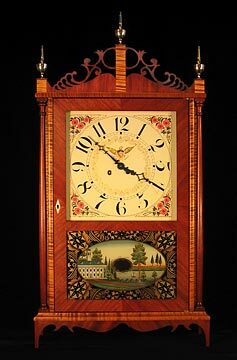  My work has been published in a number of places, including a 2004 issue of Fine Woodworking Magazine and a 2004 issue of the Bulletin of the National Association of Watch and Clock Collectors.  I joined other artisans in participating in A Gathering of Traditional Artisans in May, 2006. See Cabinetmaker Larry Crossans web site. I am a maker of clock cases and a teacher of clock case making. I build reproduction clocks from what I call America’s Golden Age of Clockmaking. That was from about 1800 to 1840, an era that includes the styles invented and made by Simon Willard, Seth Thomas, Chauncey Jerome, Elnathan Taber, and Eli Terry. I have studied the works of these makers and others. I became a clockmaker by accident. After I retired from the U.S. Forest Service, I was set to build furniture and cabinetry. I had been a woodworker since high school. In 1985 I took a course at the Smithsonian Institution in bronze-powder stenciling for furniture decoration. The instructor, upon learning that I was a cabinetmaker, asked me to make some boxes for stenciling. I did that, and then answered her call to build some clocks, as well. The rest is history, some of which has been made visible on this web site. 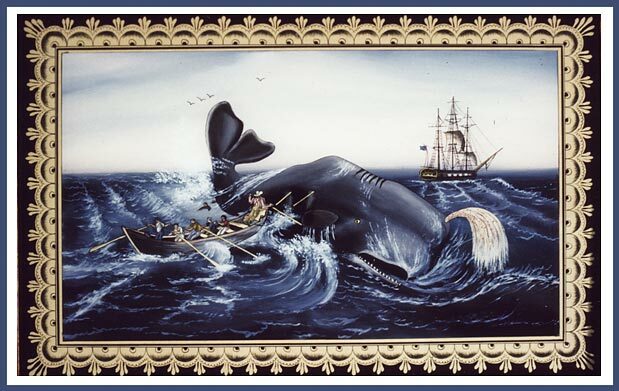 Enjoy, and thank you for visiting! Before I go any further, permit me to answer the question people ask most upon seeing my clocks: “Are these old clocks that you have restored?” The answer is “No!” The clocks shown on these pages are reproductions that have I built myself from high-quality raw lumber and other components. The carving is my work, and even the finials, like the golden eagle on the Willard Banjo Clock (below, left) are hand-cast and hand-gilded by me. I employ the services of other carefully chosen artisans for glass blowing, clock-face painting, and reverse painting on glass. I differ from other clockmakers in that I encourage buyers of my clocks to select from many authentic alternative design features for their clocks. Roman or Arabic numerals, key-lock or stirrup-shaped turn-latch door fasteners, finials of different shapes and materials, different styles of hands, a wide variety of scenes and their accompanying gold leaf or stenceled borders reverse-painted on glass, a variety of gold leaf and/or painted decoration in the spandrels (corners) of dials -- all of these ensure the uniqueness of each clock that I make. This is a very inefficient way of constructing clocks compared to the cookie-cutter approach, but it is my way. My attention to detail helps explain why so many buyers of my clocks have become family friends. It is also the reason why demand exceeds my capacity to hand craft my clocks -- by as much as 12 years with the most popular styles. 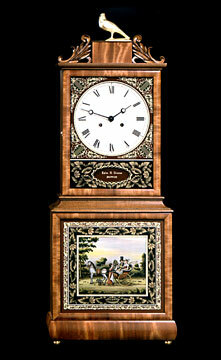 A new addition to my repertoire for 2005 - the Tavern Clock. I have made examples in quilted maple (left) and crotch mahogany. See larger photos here. My wall and shelf clocks have been exhibited at the The White House and The Maryland Historical Society and in magazines such as Early American Homes, Better Homes and Gardens’ Wood Magazine, Colonial Homes, Country Living, Traditional Homes, Maine Antique Digest, the Bulletin of the National Association of Watch and Clock Collectors, Old House Interiors, and, most recently, Fine Woodworking. 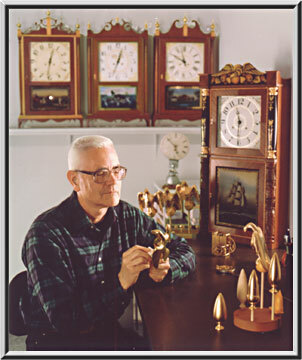 I am a past president of the Annapolis Woodworkers’ Guild, and a member of the National Association of Watch and Clock Collectors. I enjoy helping others learn the skills of the clockmaker’s trade, and I have conducted a number of workshops and seminars to help those who wanted to build a replica of an early American clock, but who didn’t know where to begin. 12" W. X 35" H.
17" W. X 33" H.
10" W. X 30" H.